There I was, standing on the 18th green at Pebble Beach, looking over a birdie putt. It had already been an unbelievable day at a place I had dreamed about for most of my life. There were a few people standing near the green, taking pictures of the majestic scenery. But as far as I was concerned, they were watching me as I was about to attempt the crowning moment in my golf life. As I waited for the rest of my foursome to deal with their own issues and make their way to the green, I took a moment to let it all sink in. 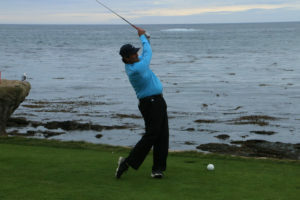 There I was, attempting to birdie one of the most famous holes in golf at one of the most historic courses in the world. Was this really happening to me? 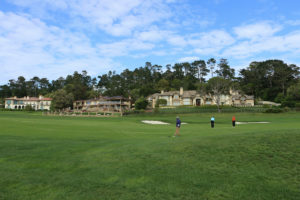 The journey to the 18th green at Pebble Beach was a long one, but only because of the amount of time. It was actually a very easy journey and one that I will certainly never forget. For years I have been on one of those email distribution lists that send you information about various golf trips being offered. A few years ago, I thought I might get a group and go to Bandon Dunes in Oregon, but I never pulled the trigger. Over time, the emails kept coming. I’d usually give them a quick look and then hit the delete button. 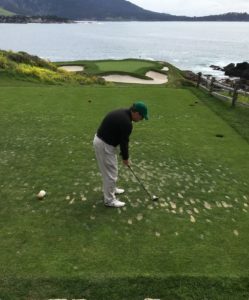 But one day in September of 2016, I got an email about a Pebble Beach trip. Rather than delete, I opened it. 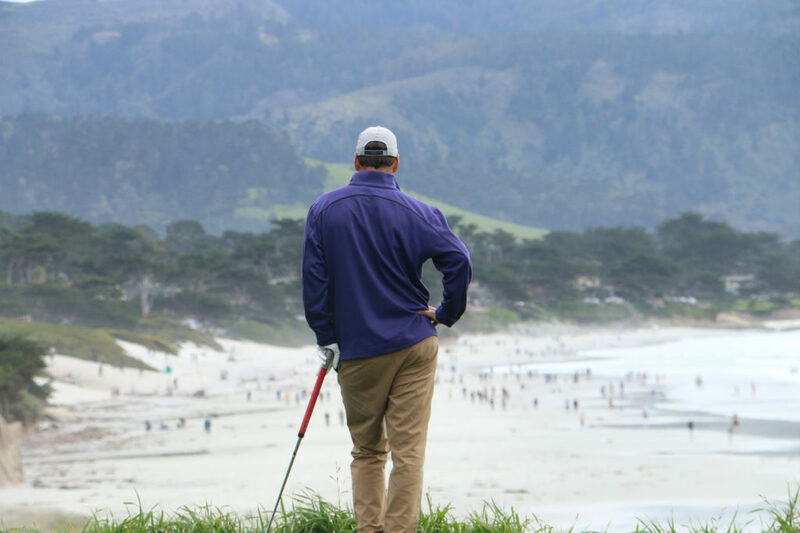 Three days, four nights at Pebble Beach, Spyglass and Half Moon Bay. The price wasn’t completely outlandish. Sure, I could kept putting it off and telling myself that one day, I would do something like that. But for some reason, I decided at that moment I was going to do this. If you wait until the time is exactly right, you’ll never go. All I had to do was find three friends to go with me. The qualifications were easy. They had to be golf nuts, have a favorable work schedule, could afford it (as far as I knew) and, most importantly, have the ability to clear it with all potential “significant” people in their life. After a few online payments, plane reservations, a vehicle rental and suddenly the last week of March, 2017, was on us in no time. Since we were flying out of DFW before the roosters even woke up – and gained two hours – we added another golf course to the trip. We landed in San Francisco and drove straight to Santa Cruz to play Pasatiempo, a course that is also ranked among the best is country (I had never heard of it). 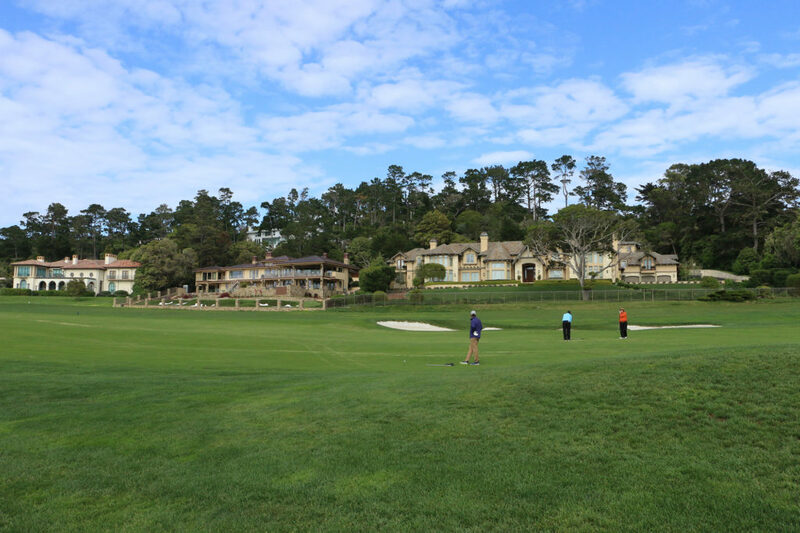 Pasatiempo is about as old school as they come – famed Augusta National designer Alister MacKenzie had a house on the front nine – and was a great way to start the trip. When you stood on the first tee, you could see the Pacific Ocean in the distance and it was very hilly. As any golfer knows, Cart Path Only is not your friend, especially on and up-and-down course, so it played even tougher than it might otherwise had (Not to mention that we had been up since 3 a.m. and just come off a three-hour flight). 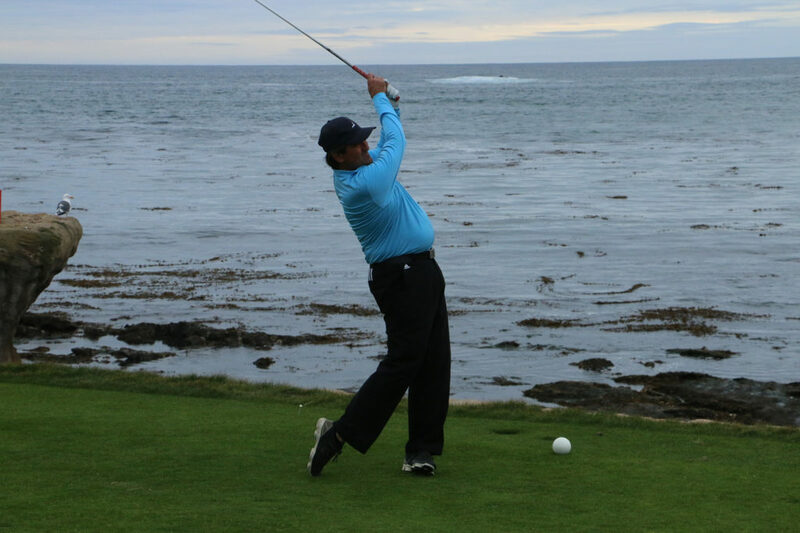 We putted out, threw the clubs in the SUV and took off for the Monterey Peninsula. 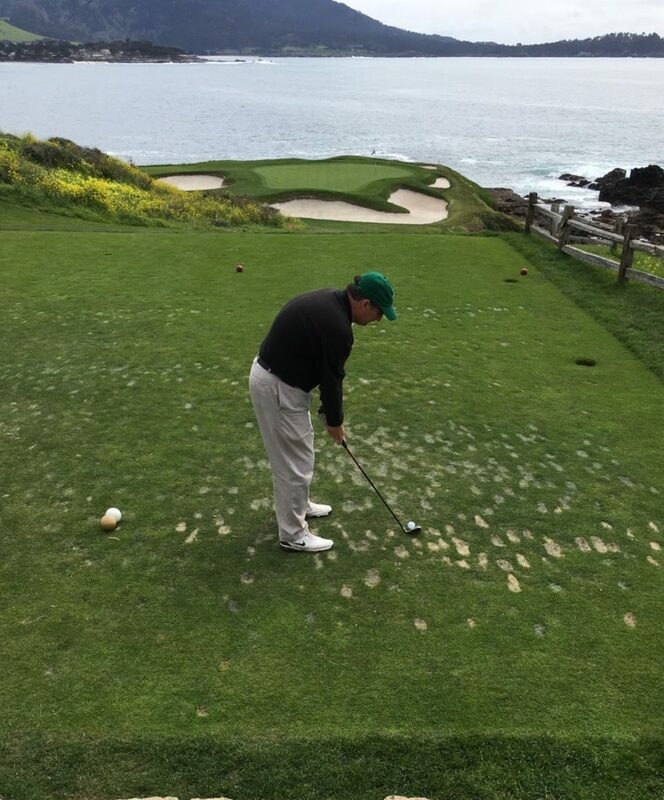 A Sunday at Pebble Beach awaited us. When we got to the Inn at Spanish Bay, it was dusk, so we really couldn’t take in the scenery. But the next morning at breakfast, we looked over the first tee at Spanish Bay and quickly realized this was really happening. From there, the drive down to Pebble Beach was filled with one picture-worthy shot after another. 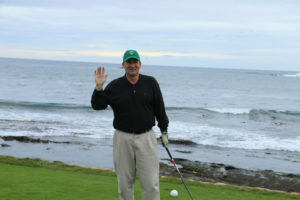 We drove by Monterey Peninsula CC, through Cypress Point, right by Spyglass, and by the famous Lone Cypress. Seventeen Mile Drive could as well have been Seventeen Hour Drive. We had a 12 p.m. tee time and got there two hours early, just to take it all in. 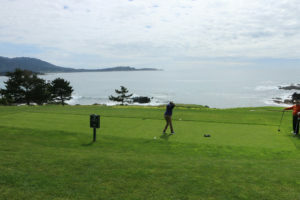 A couple of points here about Pebble Beach – (1) Don’t expect some extravagant entrance way. You drive in, park across the street and walk straight to the pro shop. (2) It’s about six steps from the Pro Shop to the first tee. Not quite what you are expecting. Click slide show to expand. Actually, it looks like a shopping mall with a tee box stuck in the middle. And there are people everywhere. Tons of gift shops, a few restaurants and high-end accommodations. You are NOT going to tee off in privacy and that doesn’t make it any easier. Nor are you going to hit a driver on the first tee. You wait all your life to tee it up at Pebble Beach and you have to leave the big stick in the bag. We all expected everyone we encountered to be a snob, but none of them were. Never did we feel like we were doing them a favor by being there. These four rubes from the South felt as comfortable as if we had grown up there. 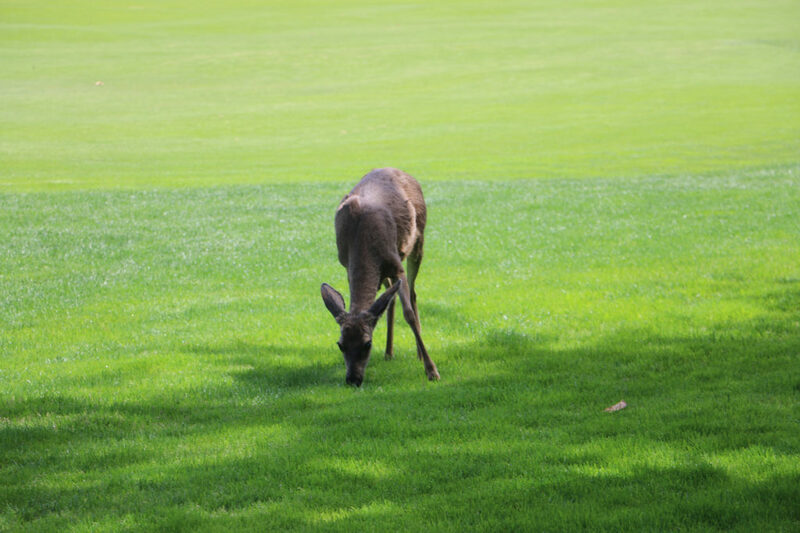 ** There was a deer waiting for us on the second tee box. He was quite a bit less threatened than his cousins back in North Louisiana. ** The first look you get at the Pacific Ocean is your second shot in No. 3. It’s impossible to fully concentrate from that point forward. ** What you see on television on the par-5 No. 6 doesn’t do it justice. The second shot is straight up a hill to a blind green. You have no idea where to hit it. ** No. 7 is everything you want it to be. 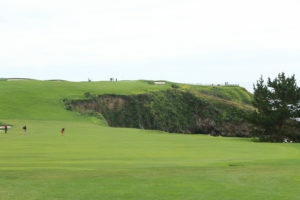 That’s the 100-yard, downhill par 3 that is stuck out on the peninsula. Seems easy, but only one of us hit the green. After taking dozens of pictures, I skulled mine into the Pacific Ocean. ** Don’t hit a driver on No. 8. Advice we wish we had known before we did. But the shot over that cliff (sadly, we were hitting 3) is pretty awesome. I hit a 4-iron on the green but missed the putt for the worst par in history. ** To me, #9 and #10 are the same hole. Ocean all the way down the right side, longer than you want it to be, and the wind whipping all around. That’s Gene Hackman’s old house by the 10th green, by the way. ** Holes 6 through 10 were a blur to me. I was too busy taking pictures, trying to soak it all in, get correct yardage, blah blah blah. It was all starting to get frustrating, which I had vowed would not happen under any circumstance. Then I came to the 11th hole, took a deep breath, knocked it in the middle of the fairway, hit an approach shot to three feet and made the putt. 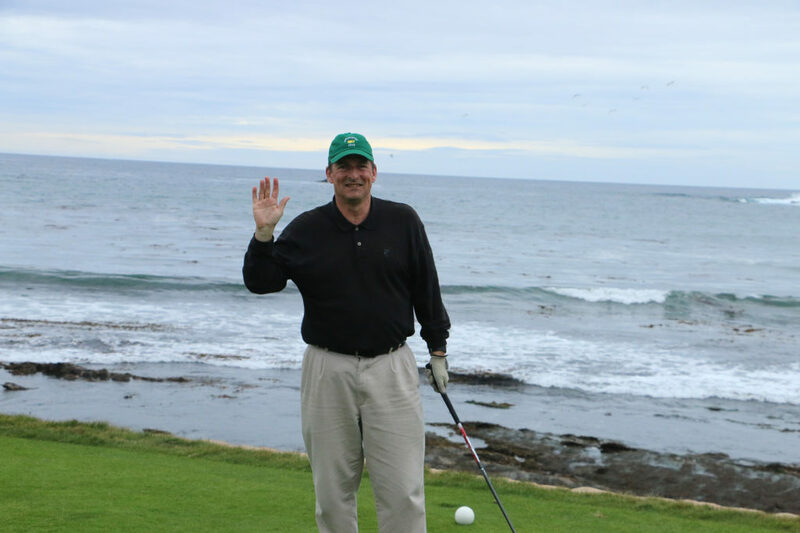 After all that, I had just birdied a hole at Pebble Beach. The rest of the back nine is mostly inland and not overly spectacular – I missed another birdie on 15 – and then you get to the 17th hole and get re-introduced to the Pacific Ocean. By then, it was getting late and a little colder. (The weather had changed probably three times already during the round.) The pin was in the front and my four-iron was gorgeous … until the wind got it and pulled into the sand. The wind had nothing to do with my next shot also landing in the sand. I limped off the green, but ready to take on one final hole. 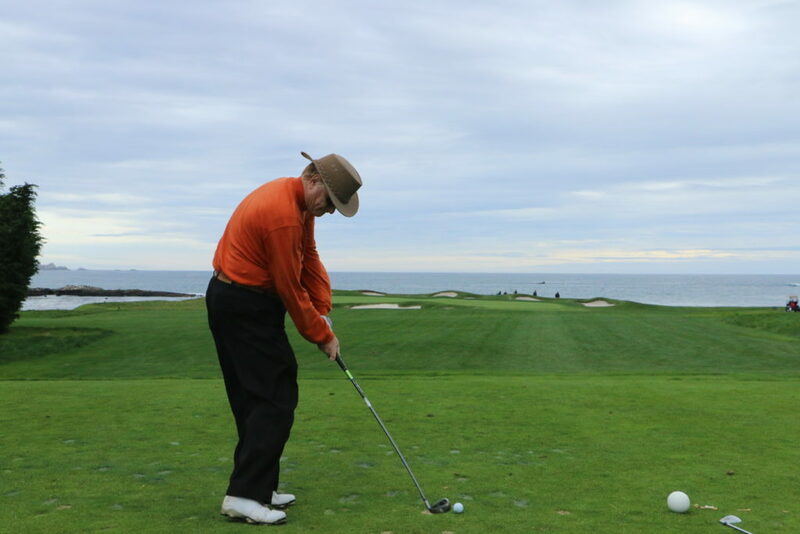 Once again, unless you’ve been there, you can’t imagine what it’s like to stand on the 18th tee box at Pebble Beach. No one wants to hook one in the Pacific Ocean but if you have the onions to try to cut off the dogleg, the par 5 becomes a fairly easy hole. We all went right, naturally, I had an impossible shot against the side of a bunker. I somehow got it out without hitting the tree that guards the entire right side of the fairway and landed in the middle of the fairway, 155 yards from the green. I hit the 6-iron of my life – I yelled out “I scorched it!” as soon as it left my club – and it landed on the green. Pin high, 15 feet away, maybe 20. The rest of the trip was fantastic. The first five holes at Spyglass might actually be a better view than Pebble Beach (it’s close). The last 13 holes are cut through the pine trees. We had a forecaddy (Dave) and he was well worth the cost. He got to take the pictures instead of me, plus read putts and rake traps. Spyglass is a great course. You’ll be stunned as to how small the pro shop is. Don’t go to the Monterey Peninsula without playing Spyglass. Half Moon Bay is up the coast and was like playing in Scotland. One tree on the entire course. We played 36 holes in 20 mph winds. The last four holes are into a massive crosswind off the ocean. At the end of the day, there’s a guy playing bagpipes by the 18th green. The course isn’t that tough; the wind is. We sacked it up the next day, flew to DFW and drove back to Shreveport. The trip could not have been any easier. I didn’t play golf for two more months. I felt a certain reverence needed to be observed.